Anglo-Saxon Britain wasn't ruled by one person and the Anglo-Saxons were not united. They invaded as many different tribes and each took over different parts of Britain. Each group of Anglo-Saxon settlers had a leader or war-chief. A strong and successful leader became 'cyning', the Anglo-Saxon word for 'king'. Each king ruled a kingdom and led a small army. From time to time, the strongest king would claim to be 'bretwalda', which meant ruler of all Britain. By around AD600, after much fighting, there were five important Anglo-Saxon kingdoms. They were Northumbria, Mercia, Wessex, Kent and East Anglia. Sometimes they got along, sometimes they went to war. Anglo-Saxons were not all equal. Click on the people at this feast below to find out about the different classes in Anglo-Saxon society. The Anglo-Saxons didn't have prisons. People found guilty of crimes were either executed or punished with fines. If they ran away, they became 'outlaws' (outside the law), and anyone could hunt them down - unless they hid in a church. The fine for breaking into someone's home was five shillings (25p), paid to the home-owner. For minor crimes like stealing, a nose or a hand might be cut off. The Saxons had a system called 'weregild', which meant that if you injured someone, you had to pay for the damage! If a person killed someone, they paid money to the dead person's relatives. The idea was to stop long fights or 'blood feuds' between families by making them pay money instead. The weregild payable for the murder of an Anglo-Saxon thane was 6,000 pennies. The weregild for a king was 90,000! 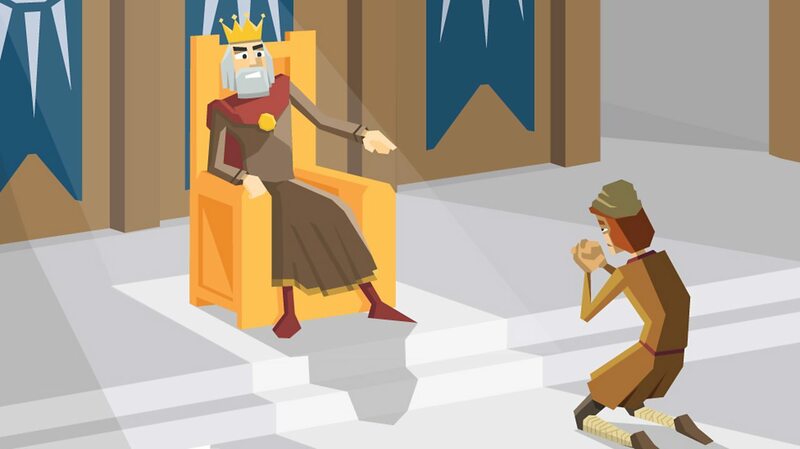 Click on the pictures below to find out how one of the most famous Anglo-Saxon kings was Offa, who was the king of Mercia from AD757 to 796. 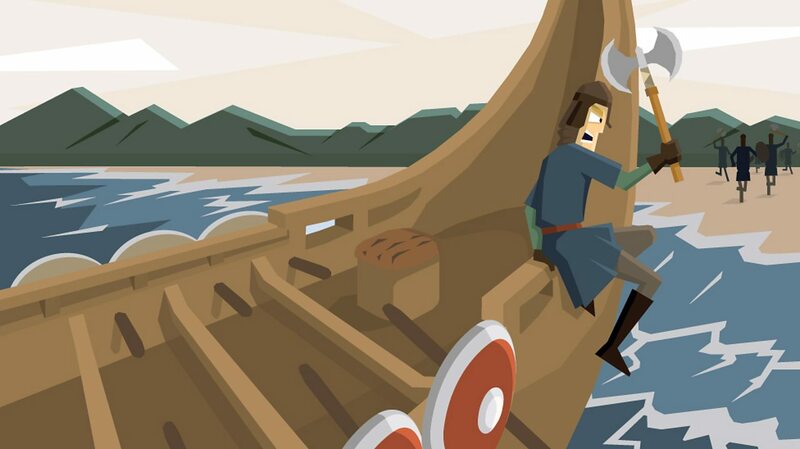 What happened when the Vikings invaded? Anglo-Saxon history tells of many Viking raids. The first Viking raid recorded in the Anglo-Saxon Chronicle was around AD787. It was the start of a fierce struggle between the Anglo-Saxons and the Vikings. Over time the Vikings took control of several Anglo-Saxon kingdoms. Eventually the Anglo-Saxons and Vikings made a peace agreement, but the fighting continued for many years. 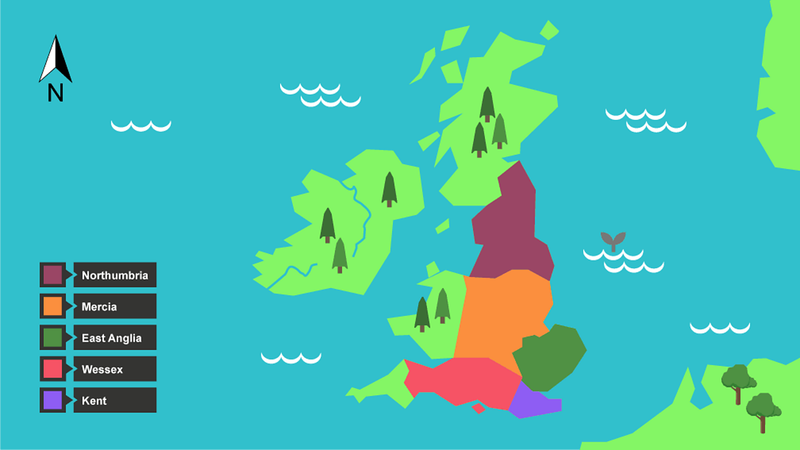 The Vikings and Anglo-Saxons divided up Britain with the Anglo-Saxons living mainly in the west and the Vikings in an area to the east, known as the Danelaw. The Vikings travelled by longboat from their homelands in Scandinavia.